BRATISLAVA, SLOVAKIA: Bratislava is the capital and largest city in Slovakia. 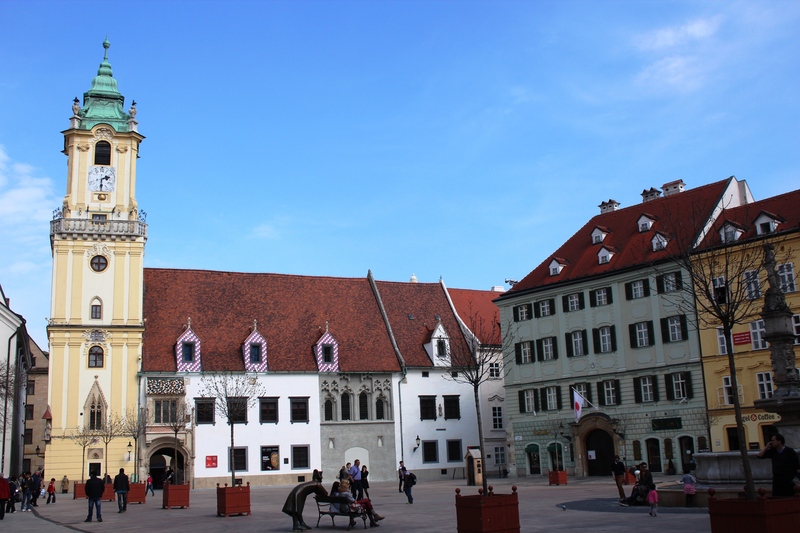 The city center or the old town of this city is very cozy and small with pleasant medieval look. You will find lots of old buildings and statues around there. You can easily walk from one side to another in just few minutes. It is definitely quieter at night near the city center but we saw some other tourists, open restaurants and cafes, but no souvenir stores were open. OUR HOTEL: Or should I say BOTEL 🙂 We actually found a boat hotel on River Danube to spend a night there. 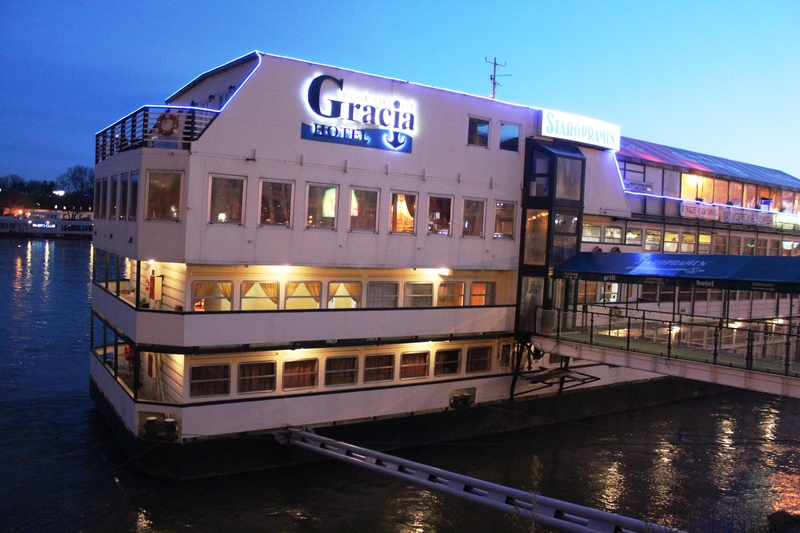 It is called Botel Gracia, the price was very reasonable, less than hundred euros per night. But spending a night on the water was simply fabulous. Not to mention you get a great view of the river and New Bridge (Novy Most). It even looks splendid after dark. The location was very convenient too, only 5 minute walk to the city center and about 15 minute walk to Bratislava Castle. Plus it offered free breakfast, free Wi-Fi, and free parking. What else can you ask for when searching for a hotel, especially in Europe? 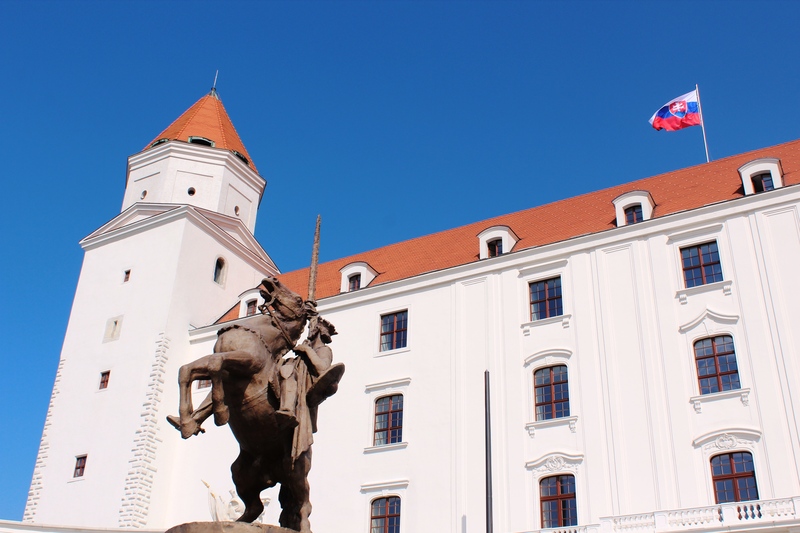 WHAT TO BUY AND EAT IN BRATISLAVA: There are plenty of souvenir stores in the old town, selling colorful decors and many gift items. But the best one I saw was on top of the hill near the castle. It had some paintings, traditional art works, dolls, ceramics, pots, and many other unique items. 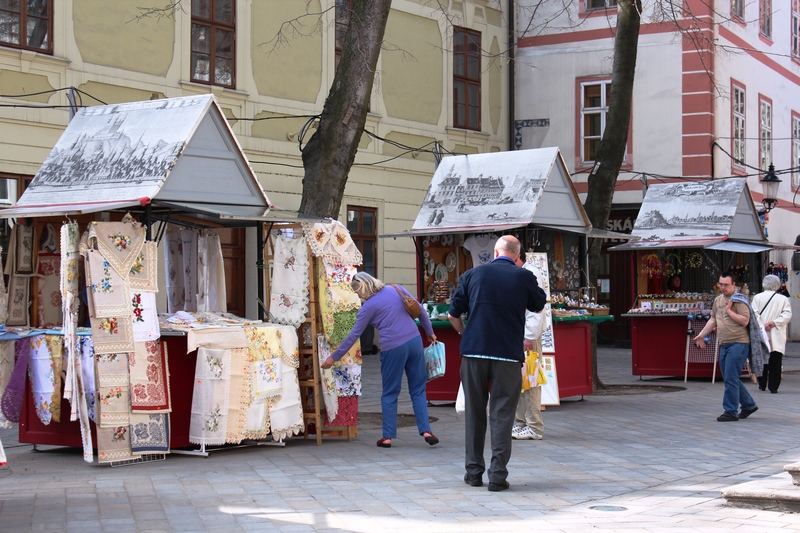 There is a market near the old town hall, where you can find some local goods, lace items, hand-made trinkets, and lots more unique items. For food, we had lunch in a restaurant near Michael’s Gate (the restaurant says “Traditional Slovak Restaurant”. This place had some traditional Slovak dishes. 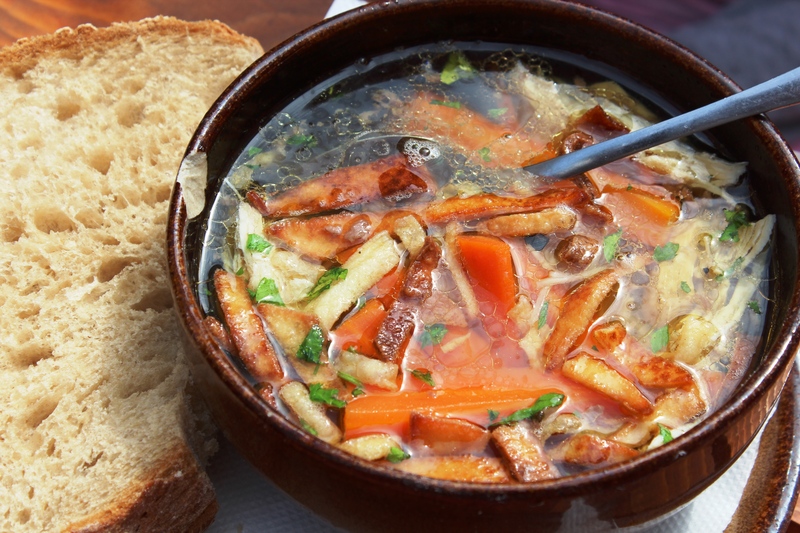 My husband tried old Slovak-style chicken soup with carrots, chicken, hand-made noodles and French fries. I never had French fries in my soup before…delishhh. Another dish I tried was old Slovak-style roasted beef with fried onion. Very unique in taste and the fried onion added burst of flavor in my mouth with a piece of roasted beef…yummm. PLACES WE’VE VISITED: We had an evening and the next whole day to explore the city. Bratislava is a walkable city. We went to the city center at night for dinner and just to walk around with the kids. Then next morning we started off with the castle on the hill, then came down, went to old town/city center, had lunch, and did some more walking…then we were done. We were actually done around late afternoon. 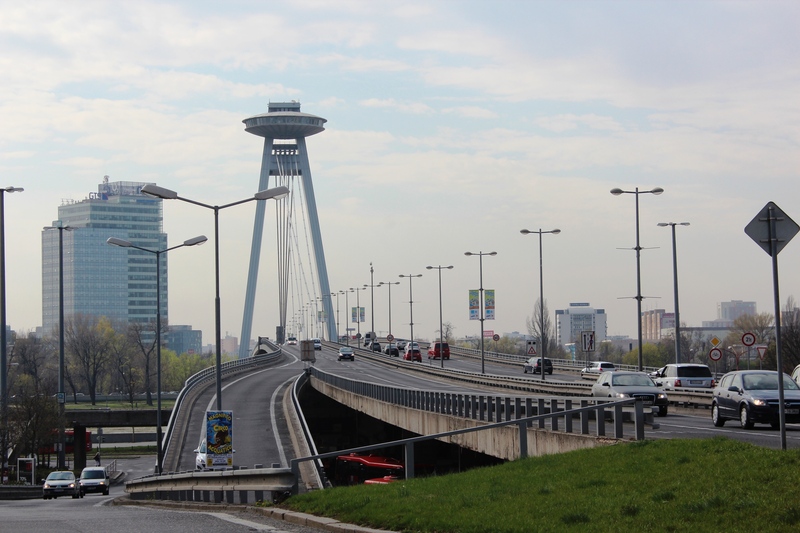 1) NOVY MOST or NEW BRIDGE: New Bridge is over River Danube and can be easily identified with its flying saucer-like structure housing an observation deck and a restaurant, called UFO. It looks gorgeous at night with all the lights. 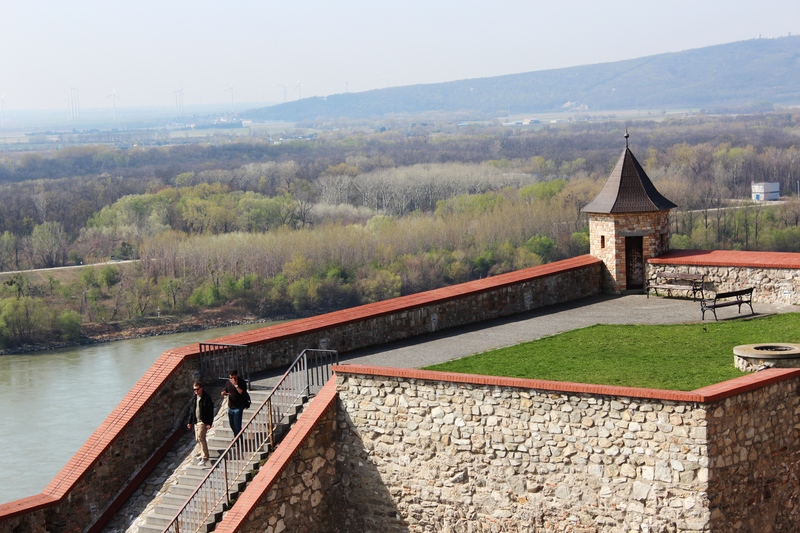 2) BRATISLAVA CASTLE: The castle on the hill-top is visible from almost any part of the city. This is a must-see in Bratislava. 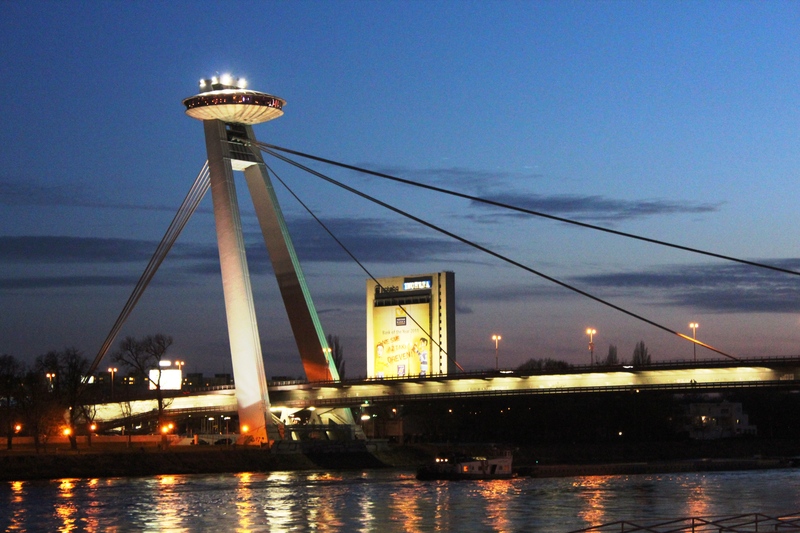 You can spend an hour or two enjoying the open space, statues, and panoramic view of River Danube, New Bridge, and the city itself. The castle courtyard is very simple and plain, may just disappoint you. It is free to enter the castle. There is a Treasure Room that can be visited for 6:50 euros per family (2 adults and 3 kids). We weren’t allowed to take any pictures inside the museum. It took us less than half an hour to tour the museum. If you are walking, shortcut way to get there is taking the stairs. There is another way to get there, which avoids the stairs but takes longer time. 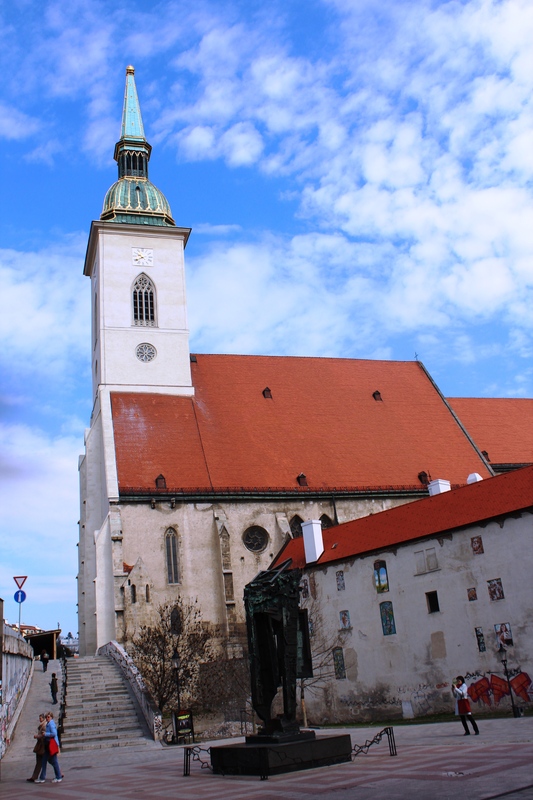 3) ST. MARTIN’S CATHEDRAL: The church located below the hill of Bratislava Castle. There is a stairs which will take you up to the church entrance. It is free to enter but visitors are not allowed to take picture s inside. There is a statue of Rafael Donner, one of the most famous Austrian sculptors from the 18th century, in the cathedral. 4) MICHAEL’S GATE: This is the only gate remaining from a medieval fortification from around 1300 A.D. 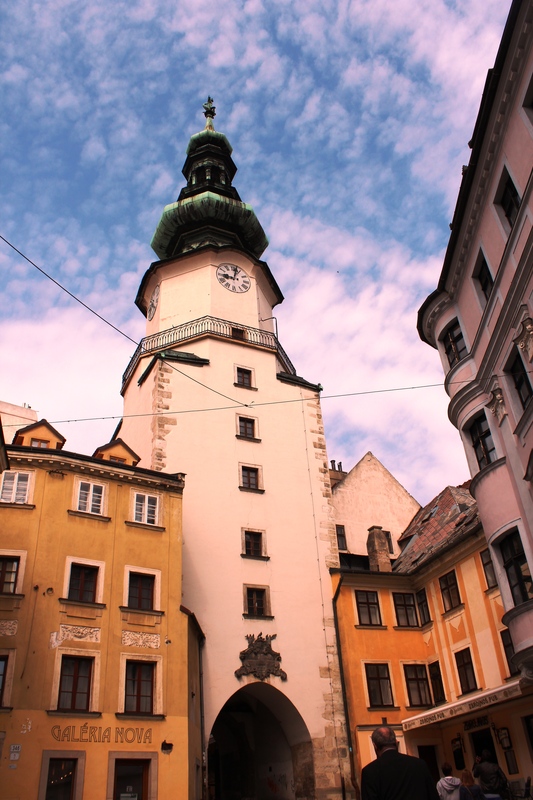 It is located in the old town with a tall tower, called Michael’s Tower. Under the gate you will find lots of luxury shops, restaurants, designer stores, and souvenir shops. The street is known to be one of the most expenssive streets in the Central Europe. 5) OLD TOWN: It is one of the smallest historical centers around but definitely charming in its own way. It is mostly pedestrian areas, but be careful of the cyclists and occasional cars that come by rather quickly. There are some red trains that will take you around the old town and the castle for an hour for 10 euros per person. 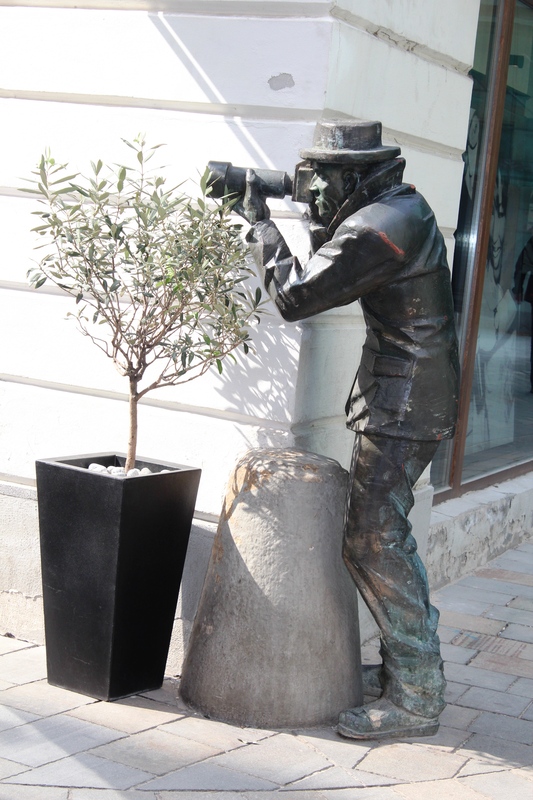 Some statues that you may want to look for are “Man at Work” and statue of a paparazzi with his camera behind a wall, located near a restaurant, called Paparazzi. National Art Gallery, Slovak National Theater, Slovak National Museum are very close to the old town, may be few minutes of walk will take you there. 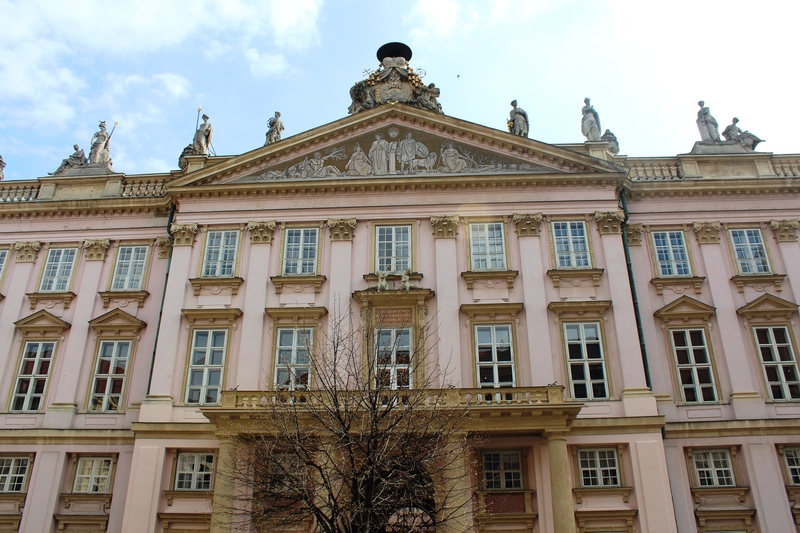 6) PRIMATE’S PALACE: This is located in the historic city center near the Old Town Hall in Primacialne namestie. It is currently the seat of the Mayor of Bratislava. Opposite of this the Magistrate Office is located. 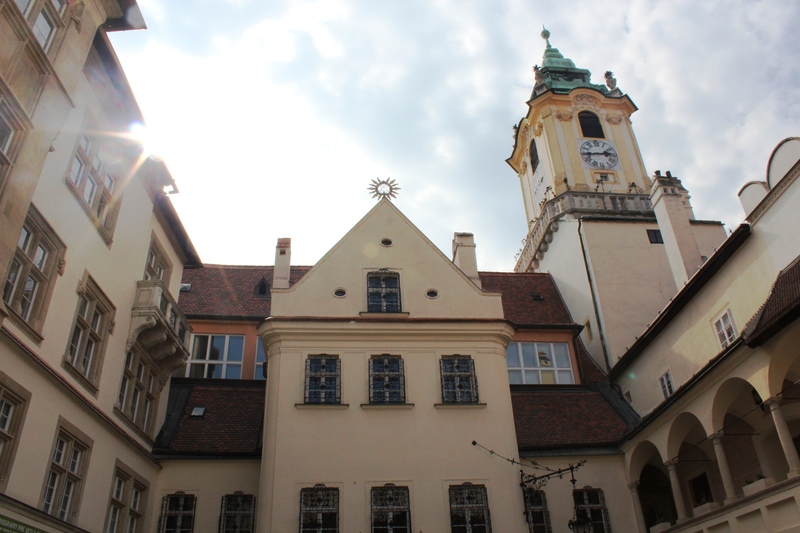 7) OLD TOWN HALL: Old Town Hall of Bratislava is in the main square of the city in Hlavne namestie. There are some interesting statues there: a man with hat leaning on a chair and statue of a guard in the middle of the square. Love this post and photos. The embroidered linens in my closet are just like those in your first photo, from my traveling grandfather. Lovely. We are off to Prague & Budapest soon and I am quite excited to finally visit Eastern Europe. Fascinating blog! I love all the cities we visited in Eastern Europe, there is a magic in all of them. You will love Prague and Budapest…so many things to do and see in both the cities. I can’t keep up with my blog with all the cities we’ve visited after moving here in Belgium…. Thanks for the reminder that I still have to make pages on Prague and Budapest. Have a safe journey and thanks for stopping by Cindy. Your pictures are lovely! 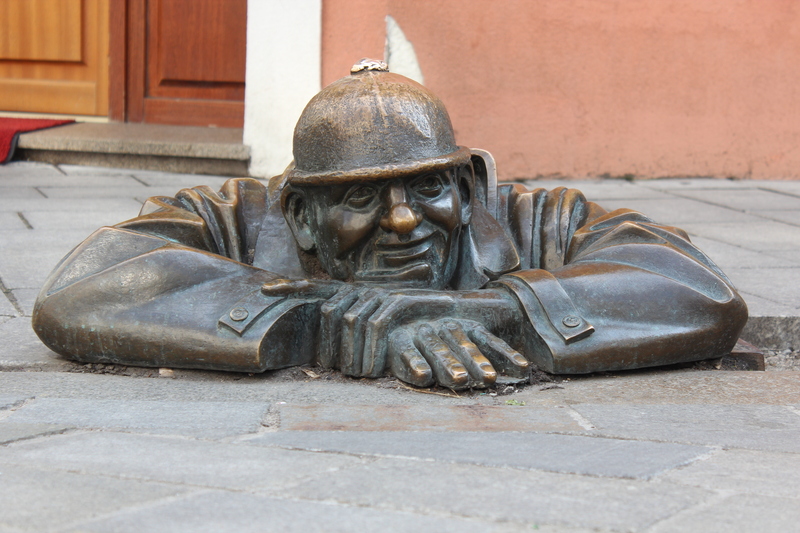 I also enjoyed taking photos of the different statues scattered around the old town of Bratislava. I hope to go back there soonish, and explore more of the country, beyond Bratislava! Thanks for the link to my Slovakia post!